For many Streets of Rage 2 is a perfect beat em up, one that successfully expanded on the foundation laid down by Final Fight. It stole the crown from that venerable series to become the standard by which all future brawlers would be judged. And so anticipation ran high when Streets of Rage 3 was announced. With its predecessor to use as a base I don’t think it’s an exaggeration to say many expected it become the standard for the genre. 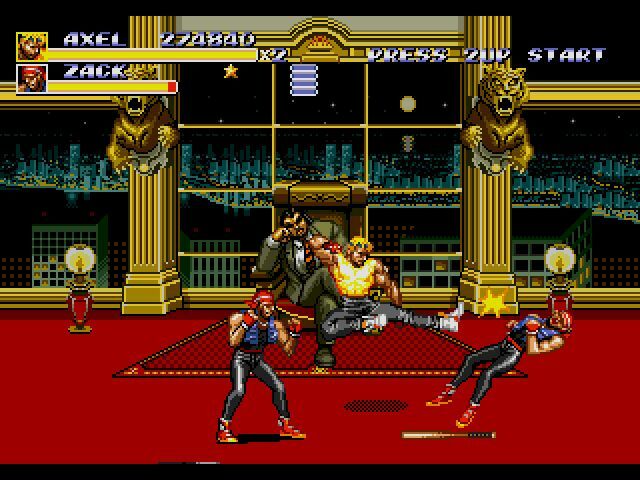 Well Streets of Rage 3 is an amazing game however it falls short of the lofty bar set by its predecessor. This only applies to the localized version. A number of alterations were made to the game before its release in the US, none of them good. While some of the changes can be understood (the flamboyantly gay parody first boss was a bit much) the balance changes are a bit on the excessive side and make the game more of a slog than it should be. A series of bombs have been planted throughout the city, all the workings of a mysterious mastermind. On top of the bombs the police chief has also been kidnapped with Axel being implicated in the act. Along with Dr. Zan the trio of Axel, Blaze, and Skate must rescue the police chief to clear Axel’s name and also save the city from destruction. Far more story driven than every beat em up that came before it Streets of Rage has an elaborate story told through cutscenes after every level. Or I should say it did. The story is one of the biggest elements changed in localization for no inexplicable reason. In its Japanese release Mr. X along with his RoboCy corporation plan to start a global war using a new explosive called Rakushin. More backstory is given to Dr. Zan and there are more cut scenes detailing the plot. Most of these were removed for its US release leaving the game with little context for its story beats. For the most part Axel, Blaze, and Skate are unchanged leaving Dr. Zan as the sole option for those looking for something new. As the replacement for Max and Adam he occupies the slow strongman role but is really unique in terms of his reach and use of electricity. As a cyborg he doesn’t run but actually slides along the ground and whatever weapon he picks up is turned into a ball of energy that will bowl foes over. In terms of combat Streets of Rage 3 has quite possibly the deepest battle system within the beat em up genre. There have been all sorts of little tweaks that make the game faster and more diverse. All characters can now dash and perform a defensive roll upwards or downward. The roll in particular is especially helpful in avoiding damage or keeping pace with some of the faster enemies and bosses. Dashing modifies most of the moves performed with it, including weapons. Speaking of weapons, there are a few new attacks that can be performed depending on the weapon currently in hand, some of which inflict obscene amounts of damage. To offset this weapons have a separate life bar and will eventually break. The special moves unique to each hero have also seen their share of tweaks. The timer has been removed and in its place is a gauge that slowly fills up; once full you can perform a special move without the health penalty. In addition the more enemies killed without losing a life will grant a star (up to a maximum of three) which will allow you to perform an enhanced version of your special moves. It’s tough to pull off but highly rewarding if you can manage it. The roster of enemies is largely the same unfortunately with few new additions. What has changed however is the enemy AI. The common fodder enemies are much smarter and will actually make a break for any available weapons and can even perform team up attacks. You’ll be shocked the first time you see one actually take the apple/chickens lying around for themselves which just ain’t right. As you might have guessed the game is pretty tough and was made even more so by Sega of America. The default normal setting is significantly harder than Bare Knuckle III’s hard mode with attacks inflicting less damage all around. Unfortunately the rest of the game wasn’t balanced around this and it becomes a slog as enemies attack in groups of 6-7 in a row. Life restoring items aren’t plentiful so you’ll have to tough it out longer than expected. There are a few areas that mark the return of bottomless pits you can toss bad guys in for quick KOs but there are just as many traps and other stage hazards to contend with such as roaming subway trains and tripwires. There’s a hectic getaway sequence involving a bulldozer that stands out as pretty inspired. There are multiple endings depending on your actions in stage 6. Here you have a non-linear building to explore and have to race against a clock to save the police chief. If you save him in time you fight the game’s true final boss in another timed battle. The cool thing is if you fail the game continues along an alternate path. While it is a nice addition the endings only slightly differ in content. In addition there are a few hidden characters to unlock for some added replay value. Streets of Rage 3 is an exceptionally beautiful game, one of the best for the Genesis. Technically it doesn’t seem any more advanced than part 2 however Sega’s artists have improved and as such manage to pack in a ton more detail. The sprites are about the same size but more detailed and better animated with more on screen than ever before. The one area it doesn’t surpass its seminal predecessor would be its backdrops. Due to the story taking place entirely in the city you won’t get to visit exotic locales around the world with the generic city streets, subways, and building exteriors having an air of familiarity to them. While the graphics are better the music is most certainly not. It would have been a tall order for any composer to top the Streets of Rage 2 OST as it is one of the greatest of all time. The overall soundtrack ditches the slow melodies of before for a completely hard techno sound that is loud and abrasive; it might eventually grow on you but is simply not to my tastes. There’s definitely plenty to love about Streets of Rage 3 but in the end it doesn’t manage to reach the same lofty height as its legendary predecessor. It’s easily the second best in the series but I would point anyone interested in the series to the second game first unless they have access to Bare Knuckle III, which is superior just by being balanced perfectly.